At first glance, it may appear as though tsunami is poised to crash over the Florida coastline. But much to the relief of Panama City residents, this breath-taking series of photographs shows a natural phenomenon far less destructive - waves of clouds. 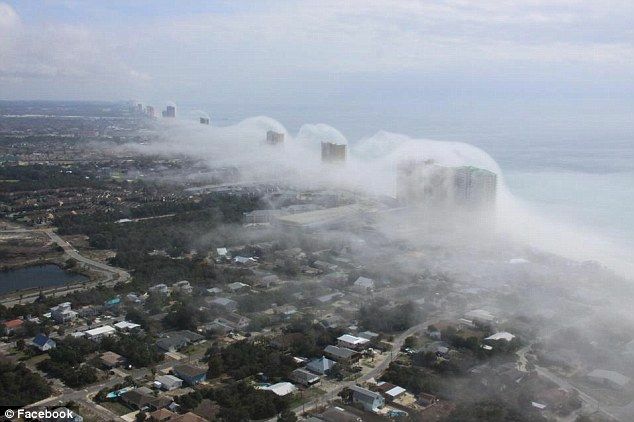 Helicopter pilot JR Hott captured these breathtaking images, which show the low-lying haze swooping over high-rise buildings down the coast. ..At first glance, it may appear as though tsunami is poised to crash over the Florida coastline. KATU reports Mr Hott captured the images hovering over the Gulf of Mexico after one of his pilots came in from a flight on Sunday. 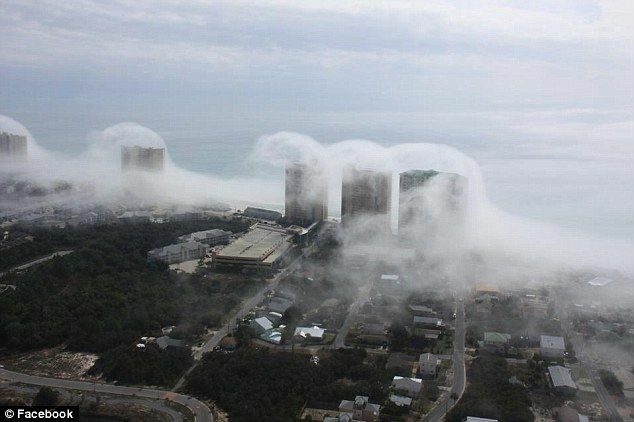 Before his chopper could be engulfed by the heavy fog, Mr Hott flew up to capture the wave-like formations. 'We jumped into helicopter and took off,' he said. But he didn't have long to descend. 'Within a few minutes after we landed, it covered up the helipad,' the seasoned pilot said. 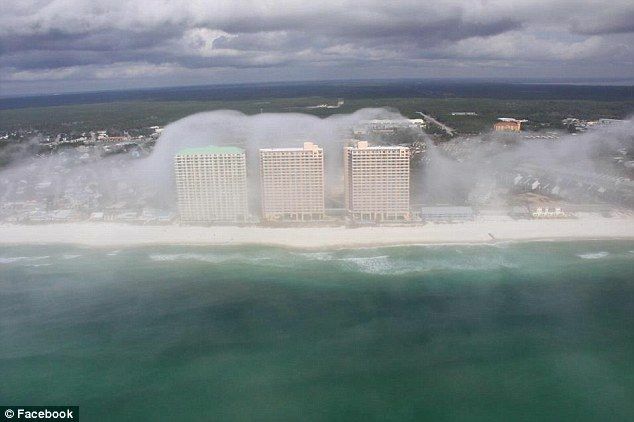 According to Dr Greg Forbes, of Weather.com, the phenomenon occurred as a result of warm, moist air forming 'just right' as it blew into the coastline, forming a low-lying fog that dissipates as the air cools with altitude. Dr Forbes explained on the website: 'You see the clouds forming off shore, as the winds from south to north push them toward and then up over the high rises as the air rises and reaches its crest. 'The other thing that's happening is with friction, the air slows down as it just begins to move onshore,' Dr Forbes explained. Mr Hott, posted the images on Facebook, and they've since swept the internet, receiving an overwhelming response. 'Oh my God, we've got thousands of shares and thousands of likes,' he told KATU. 'It's amazing to me how this thing has gone nuts,' he said. 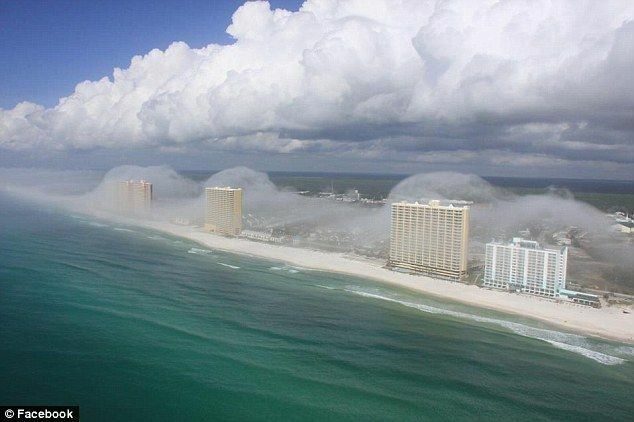 Back in December 2011, the people of Alabama also experienced a cloud 'tsunami'. the Cloud Appreciation Society explains the phenomenon as a 'result of turbulence in a layer of Cirrus cloud where air currents exist of differing speeds or directions'. It is reportedly more likely to occur in an area of vast plains, and is called the Kelvin-Helmholtz because Scottish baron Lord Kelvin and German physicist Hermann Helmholtz offered the first explanation for the phenomenon. Neat! I want to be a part of the Cloud Appreciation Society.. I appreciate clouds!